Badakhshan (Persian: بدخشان - Badakhshān) is one of the 34 provinces of Afghanistan. It has 28 Districts. The capital is Feyzabad. It is located in the north-east of the country, between the Hindu Kush and the Amu Darya. Badakhshan is bordered by Gorno-Badakhshan Autonomous Province and Khatlon Province in Tajikistan to the north and east. In the east is the Wakhan Corridor. The province has a total area of 44,059 km². Much of the land is the Hindu Kush and Pamir mountain ranges. 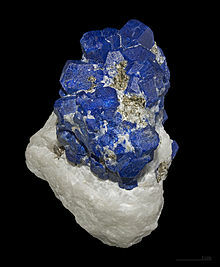 Classic lazurite specimen from Sar-e-Sang district. Size 7.4 x 5 x 5 cm. Badakhshan is one of the poorest areas in the world. Opium poppy growing is the only real source of income in the province. Lapis lazuli has been mined in the Sar-e-Sang mines for over 6,000 years. The mines were the largest and most well-known source in ancient times. The population of the province is estimated at 889,700 people. The majority of them are Persian-speaking Tajiks. The residents of the province are largely Sunni. The province is represented in Afghan domestic cricket competitions by the Badakhshan Province cricket team. ↑ 2.0 2.1 "Afghanistan Energy Information Center" (PDF).